SBM YG series mobile jaw crusher plant takes jaw crusher as the core crushing machine. There are mainly four types of mobile rock crusher plant, which are YG938E69L, YG938E710L, YG938J811L and YG938E570L. To different model, different feeders and jaw crushers are configured. SBM YG series mobile jaw crusher plant takes jaw crusher as the core crushing machine. There are mainly four types of mobile rock crusher plant, which are YG938E69L, YG938E710L, YG938J811L and YG938E570L. To different model, different feeders and jaw crushers are configured. 3) Good reputation of cost savings, durability and unmatched performance in the variety of tasks to which they are applied. 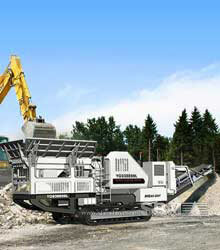 3)	A comprehensive range of mobile jaw crusher plant to suit a broad range of application. SBM YG series mobile jaw crushers are widely used for iron ore mobile crushing in Malaysia. Aside from iron ores, YG series mobile jaw crushers are also widely used in granite and limestone crushing. For Malaysia mobile crushing solutions and other countries mining, you can trust SBM as your ideal brand. "There is on words other than excellent to describe the products and service from SBM."